Greek electronic composer Sakis Gouzonis has just self-released a 10-track album titled “Open Horizon.” This is his eleventh studio album and contains ten original electronic music compositions. Official Track List: A Healing Touch, Living Heroes, Stronger Every Minute, We Can Win, Forever Young, When Our Hopes Are High, For Every Man Who Has A Dream, Warm Hearts, Kind And Prudent, Beyond This Earth. Sakis Gouzonis’ excellent musicianship and superb technique have been praised by musicians, critics, and audiences alike, both in Greece and abroad. He is a prolific music composer and the recipient of numerous Greek and international music awards. His music has been heard on radio and television and his many recordings have been recommended by many Greek and international media outlets. Sakis Gouzonis is offering up his newest album titled “Open Horizon” via his official website, https://www.sakisgouzonis.com. The Greek composer has released a new album of electronic and cinematic music. “Open Horizon” is his eleventh release and consists of ten original music tracks. The main theme of his new album is humanity’s future, a future which is positive and constructive. A plethora of beautiful melodies, wonderful chords, and superb key changes, ensure the satisfaction of his voluminous audience worldwide. Sakis Gouzonis is a composer and keyboardist from Elassona, Greece. In 2008, Sakis established himself as one of the best Greek electronic music composers, impressing critics and audience alike with the elegance and beauty of his debut album, “First Contact.” Sakis has also been the recipient of several awards over the course of his prolific music career. 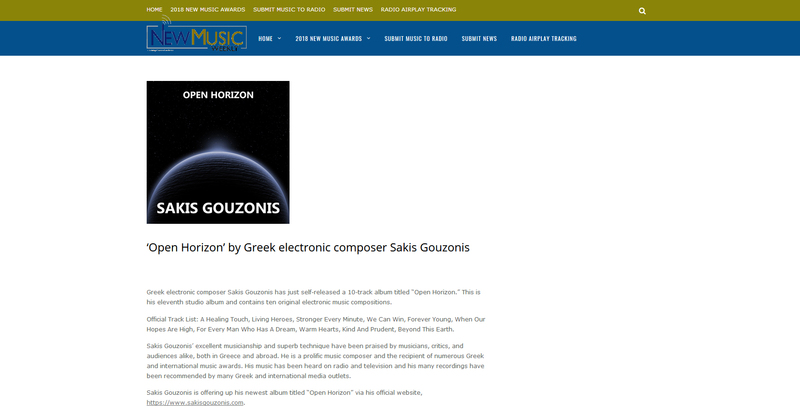 “Open Horizon” is available from the composer’s website, https://www.sakisgouzonis.com. Greek electronic composer Sakis Gouzonis has just self-released his eleventh studio album titled “Open Horizon.” As always, Sakis brings us atmospheric and hauntingly beautiful soundscapes that are rich in nuance and which should appeal equally to fans of electronic and classical music. 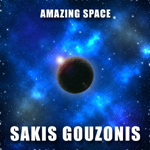 In 2008, Sakis Gouzonis released his debut album, “First Contact,” which captivated critics and listeners alike. Since then, Sakis has released ten more studio albums, has won numerous Greek and international music awards, and has gained a huge following worldwide through music social networks. 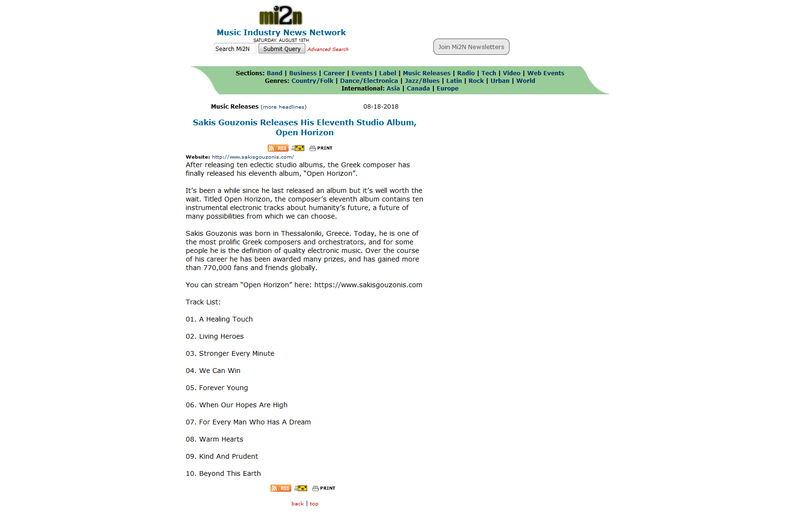 You can stream or download “Open Horizon” via https://www.sakisgouzonis.com. 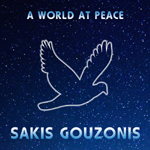 Sakis Gouzonis’ previous releases include: First Contact (2008), New Earth (2009), The Tree Of Life (2010), Ultimate Love (2011), Vast Victory (2012), Spiritual Unity (2013), Golden Heart (2014), A World At Peace (2015), Liberating Truth (2016), Amazing Space (2017). After releasing ten eclectic studio albums, the Greek composer has finally released his eleventh album, “Open Horizon”. It’s been a while since he last released an album but it’s well worth the wait. Titled Open Horizon, the composer’s eleventh album contains ten instrumental electronic tracks about humanity’s future, a future of many possibilities from which we can choose. Sakis Gouzonis was born in Thessaloniki, Greece. Today, he is one of the most prolific Greek composers and orchestrators, and for some people he is the definition of quality electronic music. Over the course of his career he has been awarded many prizes, and has gained more than 770,000 fans and friends globally. 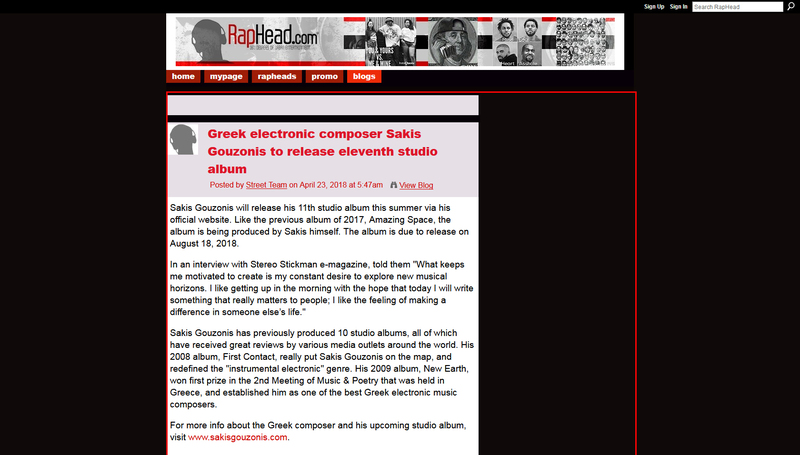 Greek electronic music composer Sakis Gouzonis will release his 11th studio album on 18 August 2018 through his official website. In the meantime, you can listen to and download all of his previous studio albums at www.sakisgouzonis.com/sakis-gouzonis-music. Up to now, Sakis has released 10 studio albums, from First Contact in 2008 to Amazing Space in 2017. During the 2nd Meeting of Music & Poetry that was held in Greece in 2009, Sakis won 1st Prize for his second studio album titled New Earth, which features two of his best known music compositions, “From The Sky,” and “Elohim.” To this day, Sakis has won many awards for his music, and has gained more than 770,000 fans around the globe. 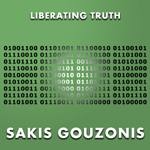 More information about Sakis Gouzonis and his electronic music can be found at www.sakisgouzonis.com. Greek electronic composer Sakis Gouzonis will release his eleventh studio album on August 18, 2018. The new album will consist of 10 tracks and it will be available via the composer’s official website. The Greek composer released his first studio album titled “First Contact” in August 2008, and since then has carved a reputation as one of the best electronic music composers. Gouzonis has the ability to make his synthesizer sound like an entire band as he takes his listeners on a fascinating musical journey to the deepest realms of their hearts. To this day, Gouzonis has released ten instrumental electronic music albums, has won a total of ten international music awards and distinctions, and has gained more than 770,000 fans and friends around the globe. To learn more about Sakis Gouzonis and his new album, check out his official website at www.sakisgouzonis.com. Sakis Gouzonis will release his 11th studio album this summer via his official website. Like the previous album of 2017, Amazing Space, the album is being produced by Sakis himself. The album is due to release on August 18, 2018. Sakis Gouzonis has previously produced 10 studio albums, all of which have received great reviews by various media outlets around the world. His 2008 album, First Contact, really put Sakis Gouzonis on the map, and redefined the “instrumental electronic” genre. His 2009 album, New Earth, won first prize in the 2nd Meeting of Music & Poetry that was held in Greece, and established him as one of the best Greek electronic music composers. For more info about the Greek composer and his upcoming studio album, visit www.sakisgouzonis.com. Greek electronic music composer Sakis Gouzonis will release his eleventh studio album on 18 August 2018. His new album will contain ten instrumental electronic music tracks, and it will be available worldwide through his official website, www.sakisgouzonis.com. Sakis Gouzonis is a multi-award-winning composer from Elassona, Greece. Since his debut album “First Contact” in 2008, he has released nine other albums, and has won a total of ten international music awards and distinctions in Greece and abroad. Today, Sakis has more than 770,000 fans and friends all over the world. It is really impressive the fact that it has all been done independently, with no record labels or music management companies involved in supporting him. For more information you can visit his official website at www.sakisgouzonis.com. Greek composer Sakis Gouzonis has announced that he will release his eleventh music album on 18 August 2018. His eleventh album will contain ten brand new tracks of instrumental electronic music, and it will be available worldwide via his official website. Sakis Gouzonis, more often referred to as Sakis, is a multi-award-winning composer, orchestrator, producer, and performer of instrumental electronic music. Since 17 October 2007, Sakis has released 10 successful studio albums, has won a total of 7 international music awards and 3 international distinctions, and has gained more than 770,000 fans and friends in 220 countries/territories. To listen to and download all of his previous music albums, visit his official website at www.sakisgouzonis.com.